SAN JOSE, Calif. -- Vice President Joe Biden implored California Democrats to tackle income inequality and resist the popular political rhetoric urging Americans to "down-size our dreams" in a nearly hour-long speech at the party's state convention Saturday, recounting a long career he said was spent working to help the middle-class. He criticized GOP leaders for failing to come up with solutions to address poverty, saying Republicans in Congress seem to have forgotten the lessons of the Great Recession, when millions of jobs were lost, homes foreclosed upon and millions of dollars in American wealth was lost. "They may have forgotten, but I haven't forgotten. I remember," he said. "I remember well the mess the president and I inherited the moment we took our hands off the Bible on that cold January day." Biden, a popular figure among Democrats, passed on a run for president this year, and despite the presidential politics dominating the airwaves this year, the race received only passing mention. Biden recited a litany of liberal talking points on which to rally, from support for a $15 hourly minimum wage, to CEO pay to reforming income taxes. "Tell me we can't afford to grow the middle class. Tell me we can't afford to increase education. Tell me we can't afford to take the burden off hardworking mothers and fathers. Tell me that that's what we can't do. We can afford that and so much more and still cut the deficit," he said to raucous applause. Biden also decried the ugly political rhetoric that has enveloped American politics, urging Democrats to resist the urge to demonize their opponents, though he took a few veiled shots at Republican presidential front-runner Donald Trump. "They haven't changed at all folks, they've just gotten meaner," Biden said. Harmeet Dhillon, vice chairwoman of the California Republican Party, said Republican solutions to reducing poverty include cutting taxes on all income brackets, but that must be accompanied by cuts in the size of the federal government to be effective. Joe Biden's solutions, she said, are "more about what the government can do to fix people's problems. The government mandating a $15 minimum wage without considering the effect on jobs ... That basic math is not being followed through." The vice president was briefly interrupted at the beginning of his speech by a man yelling that cellphones are causing brain tumors. Biden's son, Beau Biden, died of brain cancer last year. 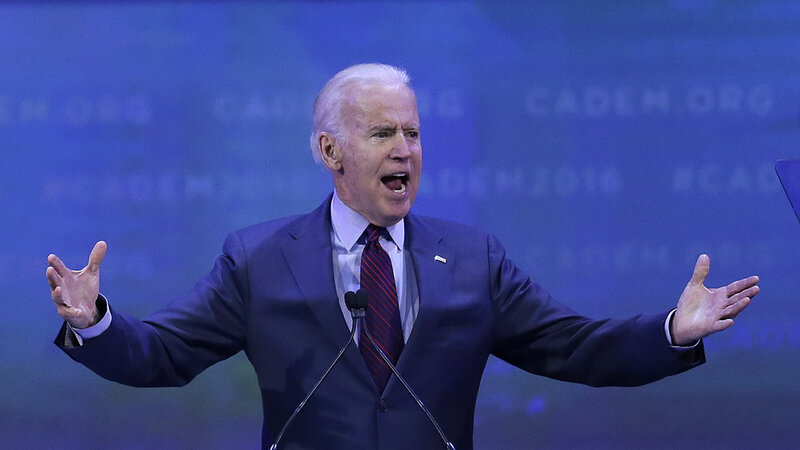 When delegates booed the heckler, Biden urged, "Hey, let's not act like Republicans." He congratulated former Secretary of State Hillary Clinton on her primary win in South Carolina on Saturday, quickly adding "I'm proud of both of them," referring also to her Democratic opponent, Vermont Sen. Bernie Sanders. Biden, the weekend's keynote speaker, was the highlight of the gathering of party faithful at their annual convention in San Jose. He was on friendly terrain, not just inside the convention hall: Democrats hold all statewide offices and a majority of seats in the state Legislature and have managed to maintain their share of voter registration as Republicans have seen theirs slide. Later Saturday, state Attorney General Kamala Harris easily won her party's endorsement in the U.S. Senate race, besting Rep. Loretta Sanchez of Orange County with the support of 78 percent of delegates, surpassing the 60 percent she needed. The endorsement marked an easy win for Harris, whose campaign had a visible presence throughout the weekend as the two compete to replace Sen. Barbara Boxer, who is retiring this year. The party's official stamp of approval could prove significant in the June 7 primary, lending not just credibility but significant financial backing, too. At least one Republican was among the Democrats gathered Saturday. Former Republican Party Chairman Duf Sundheim, who also hopes to replace Boxer in the Senate, said he was there to find common ground with Democrats on important issues such as hunger and illiteracy. "I also wanted to let them know that when I'm in the U.S. Senate, if they elect me, that I will listen to them," he said.